This is the final outcome for my character's party. I wanted my party to take place at a zoo, as my initial idea was predominantly based around the lion and zookeeper characters. 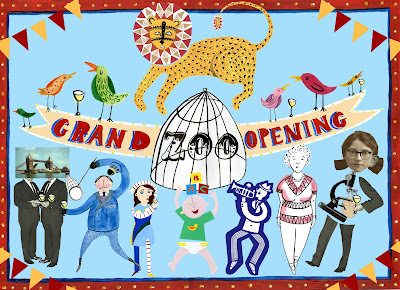 In the end I decided to create a design rather than a specific scene, taking influence from old circus and zoo posters. I'm pretty pleased with the outcome, in particular the banner and bird characters. Absolutely gorgeous end to the project. That lion... no wonder he's your profile picture I think I love him.